Condy’s crystals; Chameleon mineral; Purple salt. 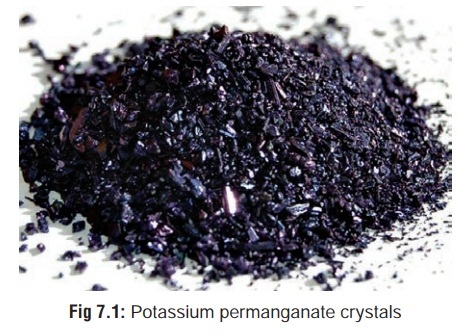 At room temperature, potassium permanganate exists as dark purple or bronze-coloured, odourless, sweetish, astringent orthorhombic crystals (Fig 7.1) that are almost opaque by transmitted light and have a blue, metallic sheen by reflected light. On contact with water it produces potassium hydroxide which probably accounts for its corrosive effects. Oxygen and manganese dioxide are also generated on contact with water. · Potassium permanganate’s industrial uses include bleaching resins, waxes, fats, oils, cotton, silk and other fibres; dyeing wood; printing fabrics; purifying air and water; etching rubber and plastic; and tanning leathers. It is also used as a fungicide; insecticide; miticide; algicide; bacteriocide; germicide; antiseptic; oxidiser; disinfectant; deodorant; sanitiser; chemical in photography; and reagent in analytical and synthetic organic chemistry. · Therapeutically, potassium permanganate is used as a topical anti-infective. In veterinary medicine it is used as a topical antiseptic, astringent, and deodorant. · Illicit uses have included the production of drugs of abuse, and as an abortifacient by topical application to the vaginal wall. About 5 to 10 grams. In concentrations exceeding 1:5000 (as a solution), potassium permanganate is an irritant, and in highly concentrated form it acts as a corrosive. It also exhibits systemic toxicity. · Intense burning pain with difficulty in swallowing, abdom-inal pain, vomiting, and diarrhoea. There is usually severe thirst. Vomitus may be purple brown in colour. Stools are often black due to manganese sulfide. · Skin and mucosa are usually stained deep brown or black due to manganese dioxide. · If potassium permanganate comes in contact with air passages, it can provoke severe inflammatory oedema leading to dyspnoea and stridor. · Complications: shock, hepatic and renal failure, acute haemorrhagic pancreatitis, and methaemoglobinaemia, which manifests as dyspnoea, headache, fatigue, CNS depression, tachycardia, acidosis, etc. · Use as an abortifacient may result in vaginal or cervical burns and erosions, with extensive bleeding, shock, severe scarring and miscarriage as possible complications. · Chronic ingestion of potassium permanganate may result in manganese poisoning. Permanganate stains are decolourised by oxalic acid plus a trace of sulfuric acid, or by hydrogen peroxide. Serum and urine manganese levels are often elevated after exposure, but their prognostic value is not clear. · Immediate dilution with water or milk may help. Gastric lavage is best avoided. However, if corrosion is not severe, it can be done with dilute hydrogen peroxide (10 ml of 3% solution in 100 ml of water). · Treatment of methaemoglobinaemia with methylene blue: 1 to 2 mg/kg/dose (0.1 to 0.2 ml/kg/dose) intravenously over 5 minutes as needed every 4 hours. · Chelation with EDTA and sodium para-aminosalicylic acid has been used in patients with manganese intoxi-cation. While there is no experience with potassium permanganate exposure, chelation might be considered in patients with neurologic effects after chronic or subacute intoxication. · Brownish black staining of tissues. · Corrosion of oesophagus and stomach. · Evidence of hepatic and renal damage. · Congestion of airways; pulmonary oedema. o Children swallowing the attractive looking crystals, mistaking them for sweets, or out of plain curiosity. o Therapeutic misuse: Potassium permanganate was formerly used as treatment for amenorrhoea, as an abortifacient, as a gastric lavage solution, and as an irrigant of the urethra and bladder in the treatment of gonorrhoea. · Suicidal ingestions have been reported from time to time.